A Massacre Of The Mavericks ~ The Bucky Channel - The World of Sports from Wisconsin's Perspective. 1) Dirk Nowitzki and Jason Kidd walked off the bench on to the court and towards the locker room with a few seconds still left in the game. 2) Damon Jones got game minutes, and hit a three pointer in his first shot. 3) The Bucks shot 58% tonight, this after shooting only 29% in the first quarter. Milwaukee improved to 21-24 as they beat the Mavericks 133-99. That is not a typo. The Bucks looked unbelievable for three quarters of basketball. This box score tells quite a story. Milwaukee looked like they were just having a great time out there, it was pretty refreshing to see and a lot of fun to watch. 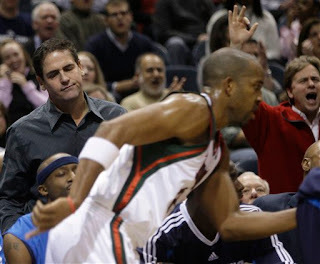 Cuban's expressions were also priceless. The big stud tonight had to be Charlie Villanueva. He scored 32 points to go with 10 rebounds and 2 assists, 2 steals while not coughing up any turnovers. Michael Redd chipped in 27 points with 7 rebounds. Sessions was perfect off the bench at 7-7 scoring 21 and dishing out 7 assists. Richard Jefferson even had 15, 7 and 8 nearing a triple-double. It just felt like to me that Damon Jones trotting out, hitting a three, pointing at Jon and Jim, and having the bench jumping around it was like the red-headed kid at the end of the bench on a high school team who gets in during a blowout and gets the team all riled up. The Bucks head to Atlanta Friday to take on the Hawks. 6:30 pm on FS Wisconsin. TBC's Player of The Game: CV. On a night where the Bucks were unstoppable from the field, their big man, Dan Gadzuric, who is supposed to have the most high percentage shots on the floor, went 3-10. Oh well, what a game. That's why we pay D-Gad (more like egads) $7 mil. per year. Nice work, Mr. Harris. I'm really happy with the direction that Milwaukee is taking. gadz started 0-7, by the way. should i post this three more times or is this enough?